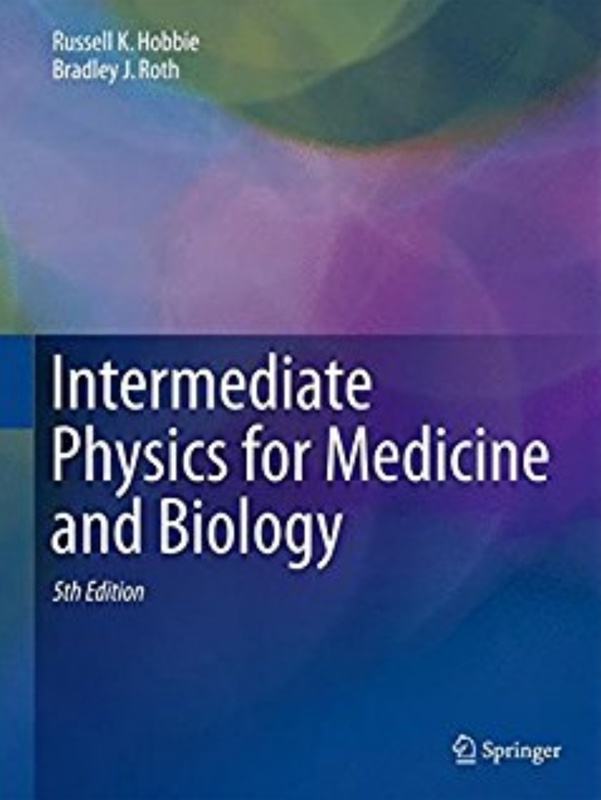 Most of my blog posts are about the textbook Intermediate Physics for Medicine and Biology. This post, however, is all about me. IPMB makes a few appearances, but its mainly me, me, me. I was recently featured in a Focus on Faculty interview filmed by the Oakland University TV station (OUTV). I uploaded a copy to Youtube, and you can view it here. I apologize for the hair; I was supposed to get a haircut before filming began, but I got busy. Watch for a cameo by IPMB. OUTV interviews Brad Roth at Oakland University. and with Auggie, Smokie, and Harvest. 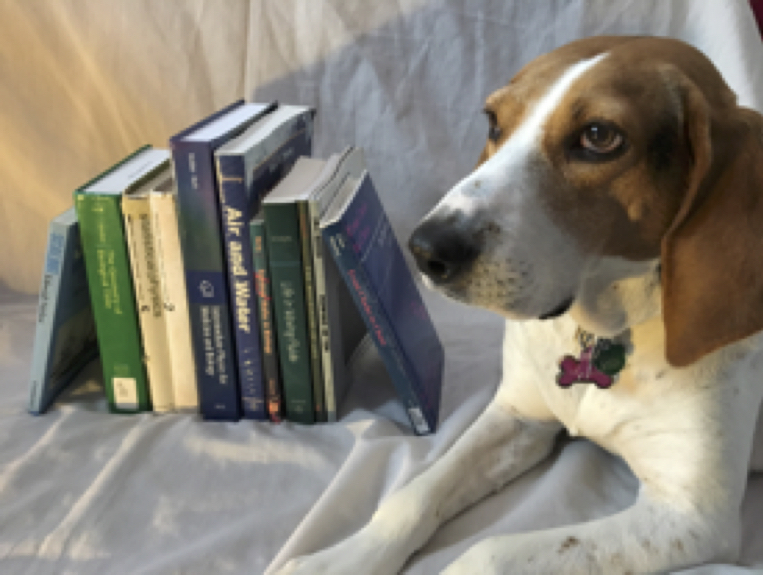 Long-time readers of this blog will remember Suki, my beloved Cocker Spaniel-Westie mix who helped explain concepts in IPMB. After her death about a year ago, my wife and I decided to get another dog. Let me introduce you to Harvest, our 65-pound Treeing Walker Coonhound. She is as lovable as Suki (though not quite as smart). We adopted her from the Making Miracles Animal Rescue. 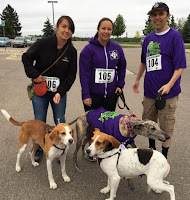 On the right is a picture of me with my daughters Kathy and Stephanie, along with Harvest and my two granddogs Auggie (the foxhound) and Smokie (the greyhound), about to start a 5k walk. We like to take them to a dog park, and as we enter yell "Release the Hounds!" in the October 2018 issue of Physics Today. Harvest is already famous. She was featured in the October 2018 issue of Physics Today. The magazine had a selfie contest that Harvest and I entered. Unfortunately, in the magazine our location is listed incorrectly; we are actually in our home in Rochester Hills, Michigan. To the left is the selfie that appeared in Physics Today. Harvest with the IPMB Ideal Bookshelf. 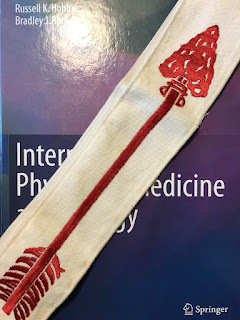 The logo for the Intermediate Physics for Medicine and Biology Facebook page is a drawing of the IPMB Ideal Bookshelf. You know how Disney often makes live-action movies out of previous animated shows? (Dumbo is the most recent example.) I’ve done the same thing. 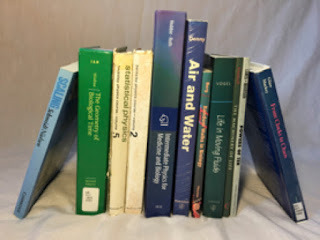 Below is a photograph of the “live-action” version of IPMB's My Ideal Bookshelf. Harvest helped me with the filming, so on the right I include a photo of her on the set. The IPMB Ideal Bookshelf, consisting of books cited in Intermediate Physics for Medicine and Biology. Below is a video (divided into two parts) of Michael Sevilla (Distinguished Professor of Chemistry at Oakland University) and me talking to a group of graduate students about how to publish their research. Enjoy! Part 1 of a discussion about Academic Publishing: How to Get Published in a Peer Review Journal, held Nov. 15, 2013 at Oakland University and hosted by the graduate student group Grad Connection. The host is then-graduate student George Corser, and the guests are Brad Roth and Michael Sevilla. by Hendee, Ibbott, and Hendee. In Section 15.15 of Intermediate Physics for Medicine and Biology, Russ Hobbie and I define the kerma. It’s measured in the same units as absorbed dose: J/kg, or gray. What’s the difference between the two? Kerma indicates the energy transferred to charged particles, while dose indicates the energy imparted to (or absorbed by) the tissue. Kerma is more closely related to the number of photons in the tissue, but absorbed dose is more closely related to biological damage. 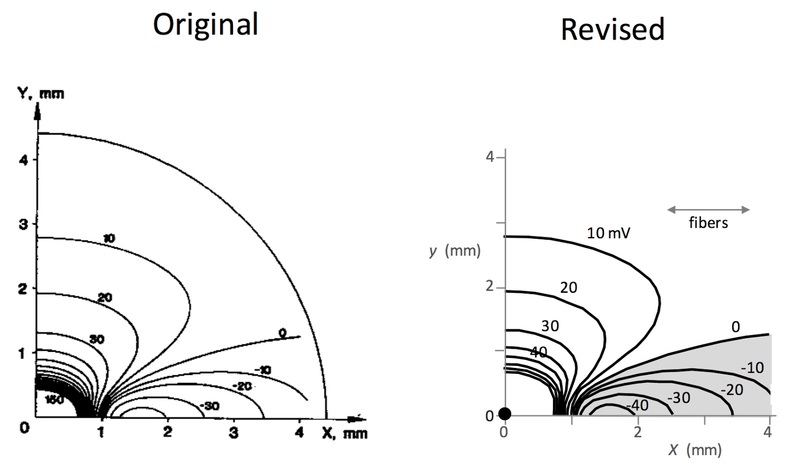 In Radiation Therapy Physics, Hendee, Ibbott and Hendee distinguish between kerma and dose. The kerma (an acronym for kinetic energy released in matter) is the sum of the initial kinetic energies of all IP [ion pairs] liberated in a volume element of matter, divided by the mass of the matter in the volume element. The absorbed dose is the energy actually absorbed per unit mass in the volume element. If ion pairs escape the volume element without depositing all of their energy, and if they are not compensated by ion pairs originating outside the volume element but depositing energy within it (electron equilibrium), the kerma exceeds the absorbed dose. The kerma also is greater than the absorbed dose when energy is radiated from the volume element as bremsstrahlung or characteristic radiation. Under conditions in which electron equilibrium is achieved and the radiative energy loss is negligible, the kerma and absorbed dose are identical. The output of x-ray tubes is sometimes described in terms of air kerma expressed as the energy released per unit mass of air. 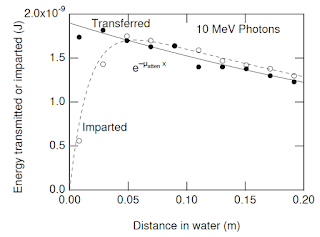 Figure 15.32 of IPMB plots the energy transferred and the energy imparted in 2-cm-thick slices versus depth when a 10 MeV photon beam is incident on water, calculated using Russ’s program MacDose. 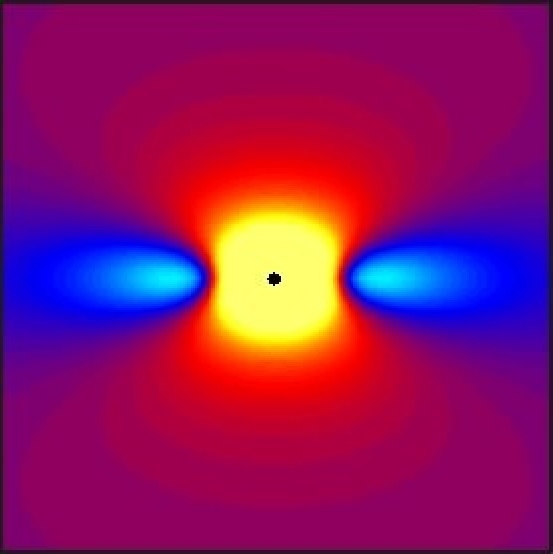 for a simulation using 40,000 photons of energy 10 MeV. If we divide both energies by the mass of the slice and average over many simulations, we get plots of the absorbed dose (dashed curve) and the kerma (solid curve). Hendee et al. provide a similar plot in their Figure 5-7. The difference between kerma and absorbed dose is useful in explaining the skin-sparing effect of high-energy photons such as multi-MV x rays used in radiation therapy. 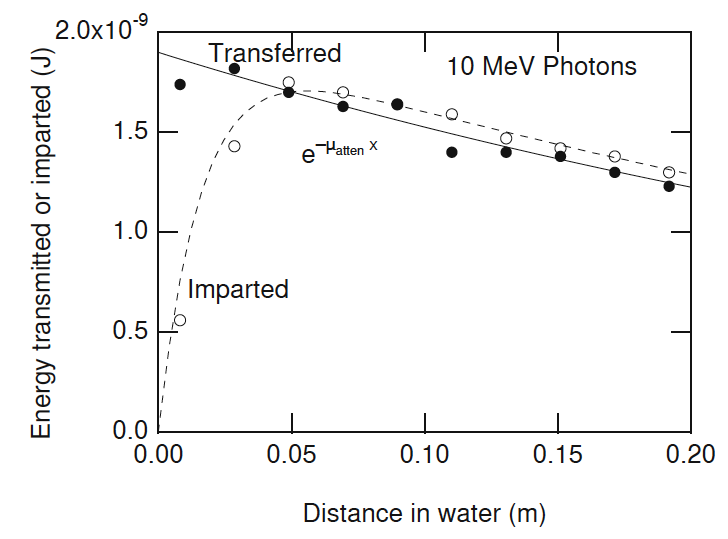 As shown in Figure 5-7, the kerma is greatest at the surface of irradiated tissue because the photon intensity is highest at the surface and causes the greatest number of interactions with the medium. The photon intensity diminishes gradually as the photons interact on their way through the medium. The electrons set into motion during the photon interactions at the surface travel several millimeters in depth before their energy is completely dissipated… These electrons add to the ionization produced by photon interactions occurring at greater depths. Hence, the absorbed dose increases over the first few millimeters below the surface to reach the greatest dose at the depth of maximum dose (dmax) several millimeters below the surface [dmax is about 0.05 m in Fig. 15.32 of IPMB]. This buildup of absorbed dose over the first few millimeters below the skin is responsible for the clinically important skin-sparing effect of high-energy x and γ rays. Beyond dmax, the absorbed dose also decreases gradually as the photons are attenuated. At depths greater than dmax, the kerma curve falls below that for absorbed dose because kerma reflects the photon intensity at each depth, whereas absorbed dose reflects in part the photon intensity at shallower depths that sets electrons into motion that penetrate to the depth. 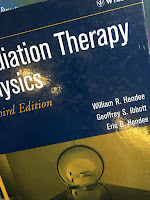 William Hendee, the lead author of Radiation Therapy Physics, is a giant in medical physics. He was the editor of the journal Medical Physics from 2005 to 2013. 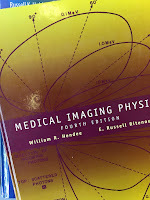 In addition to Radiation Therapy Physics, he wrote another textbook, with E. Russell Ritenour, about Medical Imaging Physics. These two books are at a level similar to IPMB, but with less mathematics and a narrower focus, overlapping our Chapters 13-18. 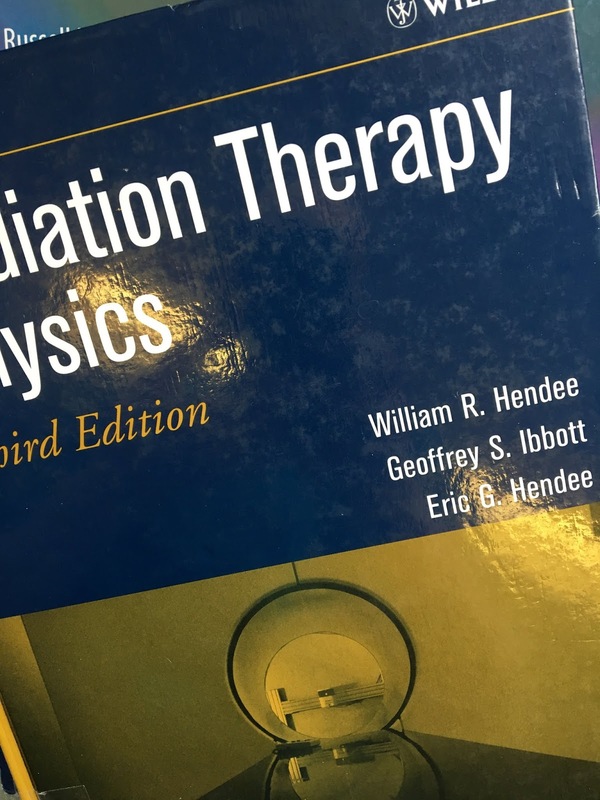 A fourth edition of Radiation Therapy Physics is out, with a new title: Hendee‘s Radiation Therapy Physics. of Living State Physics at Vanderbilt. My connection to Hendee is that—according to an interview for the American Society for Radiation Oncology—he worked for a couple years as a graduate student at Vanderbilt University with Robert Lagemann. 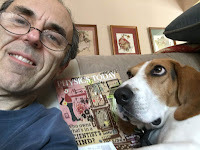 I knew Lagemann when I was a graduate student at Vanderbilt twenty years after Hendee was there, and I served as the Robert T. Lagemann Assistant Professor of Living State Physics at Vanderbilt from 1995 to 1998. 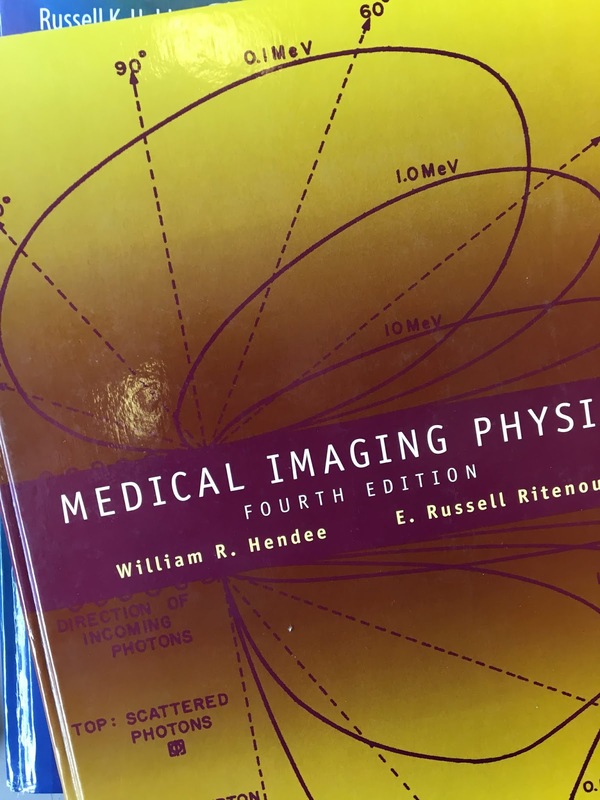 Listen to Hendee discuss medical physics in his own words. radiology's progress, and improved patient care. 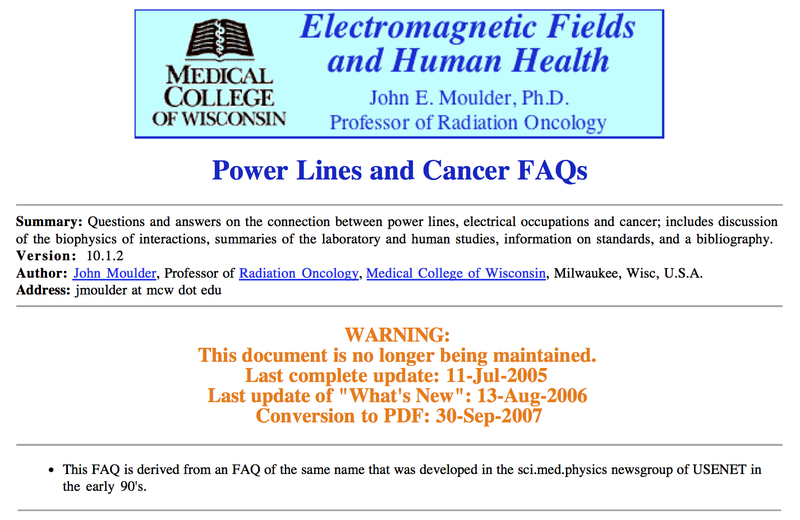 An excellent discussion of the all aspects of the problem [whether radiofrequency and power-line electromagnetic fields cause cancer] is available at a frequently updated website, Powerlines and Cancer FAQ [Moulder (Web)]. Moulder, J. E. (Web). Power Lines and Cancer: Frequently Asked Questions, www.mcw.edu/gcrc/cop/powerlines-cancer-FAQ/toc.html. Yet, I wonder... Nothing disappears from the internet. After a few minutes of googling, I found the entire website saved as a pdf, available at large.stanford.edu/publications/crime/references/moulder/moulder.pdf or https://www.nrc.gov/docs/ML1126/ML112660019.pdf. You can also download it from the IPMB website, or just click here. It begins with a brief summary. Questions and answers on the connection between power lines, electrical occupations and cancer; includes discussion of the biophysics of interactions, summaries of the laboratory and human studies, information on standards, and a bibliography. The question-and-answer format includes cross-references to other questions (e.g., “Q12” or “Q27J”). References are listed in the bibliography (e.g., “B12”). Below, I reproduce the first question. 1) Is there a concern about power lines and cancer? a connection between power line fields and cancer is physically implausible (see Q18). “The overall scientific evidence for human health risk from [exposure to power-frequency fields] is weak. No consistent pattern of biological effects from exposure to [power-frequency fields] has emerged from laboratory studies with animals or with cells. However, epidemiological studies... had shown a fairly consistent pattern that associated potential [exposure to power-frequency fields] with a small increased risk of leukemia in children and chronic lymphocytic leukemia in adults... For both childhood and adult leukemias interpretation of the epidemiological findings has been difficult due to the absence of supporting laboratory evidence or a scientific explanation linking [exposure to power-frequency fields] with leukemia.” (see Q27G). Overall, most scientists consider that the evidence that power line fields cause or contribute to cancer is weak to nonexistent. The document answers 35 questions, which together provide a detailed analysis of the controversy through 2006. How I wish the FAQ was up-to-date. 35) Who wrote this FAQ? This FAQ document originated in the early 1990's as a USENET FAQ in sci.med.physics. The USENET FAQ was maintained by Dr. John Moulder, Professor of Radiation Oncology, Radiology and Pharmacology/Toxicology at the Medical College of Wisconsin. Dr. Moulder has taught, lectured and written on the biological effects of non-ionizing radiation and electromagnetic fields since the late 1970’s. The USENET FAQ was converted to html in 1997 by Bob Mueller and Dennis Taylor of the General Clinical Research Center at the Medical College of Wisconsin. The FAQ was expanded and updated to serve as a teaching aid at the Medical College of Wisconsin. The web server and web management was provided by the General Clinical Research Center at the Medical College of Wisconsin. The development and maintenance of this document was not supported by any person, agency, group or corporation outside the Medical College of Wisconsin. JE Moulder and KR Foster: Biological effects of power-frequency fields as they relate to carcinogenesis. Proc Soc Exp Med Biol 209:309–324, 1995. JE Moulder: Biological studies of power-frequency fields and carcinogenesis. IEEE Eng Med Biol 15 (July/Aug):31–49, 1996. KR Foster, LS Erdreich, JE Moulder: Weak electromagnetic fields and cancer in the context of risk assessment. Proc IEEE, 85:733–746, 1997. JE Moulder: Power-frequency fields and cancer. Crit Rev Biomed Eng 26:1–116, 1998. JE Moulder: Une approache biomédicale: le point de vue d'un chercheur en cancérologie. In: J Lambrozo, I Le Bis (Eds), Champs Électriques et Magnétique de Très Basse Fréquency: Electricité de France, 1998. JE Moulder KR Foster: Is there a link between exposure to power-frequency electric fields and cancer? IEEE Eng Med Biol 18(2):109–116, 1999. JE Moulder: The Electric and Magnetic Fields Research and Public Information Dissemination (EMF-RAPID) Program. Radiat Res 153:613–616, 2000. JE Moulder: The controversy over powerlines and cancer, III Jornadas sobre Líneas Eléctricas y Medio Ambiente, Red Eléctrica de España, Madrid, 2000, pp. 159–168. Dr. Moulder maintained similar “FAQ” documents on “Mobile (Cell) Phone Base Antennas and Human Health” and “Static EM Fields and Cancer”. I discovered a version of the static fields FAQ at https://stason.org/TULARC/health/static-fields-cancer/index.html. I have not found the cell phone FAQ; maybe things can disappear from the internet after all. If you find it, let me know (roth@oakland.edu). I like the Power Line FAQ’s poetic closing lines. until the public and media gets bored by the subject. But the third may happen. Life Atomic, by Angela Creager. At the close of World War II, the nuclear detonations over Hiroshima and Nagasaki demonstrated the devastating power of the atom. As Americans became aware of their country’s secret development of nuclear weapons, the US government swiftly turned attention to the peaceful benefits of nuclear knowledge. Foremost was harnessing the energy of atomic fission for electrical power and transportation, but these applications would require time and technology to realize. Another by-product of atomic energy, however, was ready immediately. Nuclear reactors could be used to generate radioactive isotopes—unstable variants of chemical elements that give off detectable radiation. Scientists began using radioisotopes in biomedical experiments two decades before the atomic age, but their availability remained small-scale until nuclear reactors were developed for the bomb project. In planning for postwar atomic energy, leaders of the Manhattan Project proposed converting a large reactor at Oak Ridge, part of the infrastructure for the bomb project, into a production site for radioisotopes for civilian scientists. The US Atomic Energy Commission (AEC) inherited this plan and oversaw an expansive program making isotopes available for research, therapy, and industry. 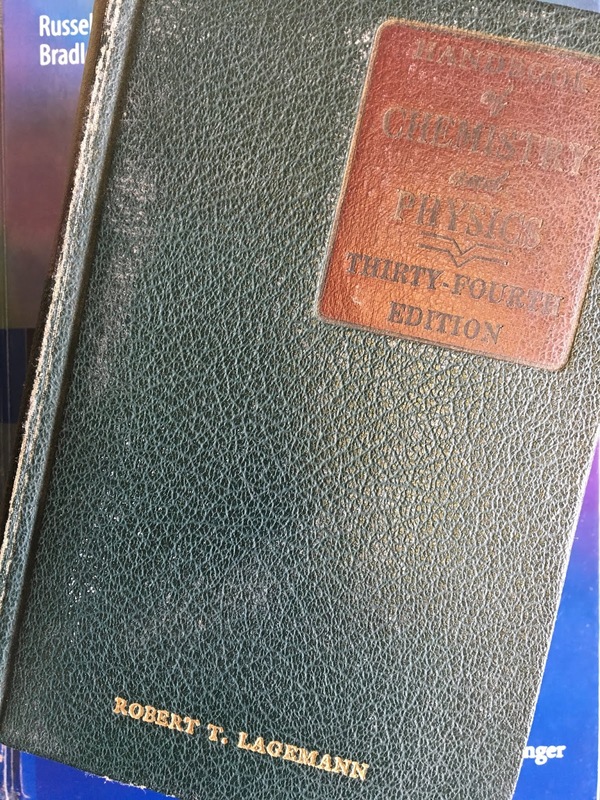 This book is an account of the uses of radioisotopes as a way to shed new light on the consequences of the "physicists’ war" for postwar biology and medicine. Creager develops an interesting analogy between radioisotopes as tracers for following biochemical pathways, and her use of radioisotopes to trace the history of twentieth-century science. ...Life Atomic uses radioisotopes as historical tracers, analyzing how they were introduced into systems of scientific research, how they circulated, and what new developments they enabled. I analyze the movement of radioisotopes through government facilities, laboratories, and clinics, both in the United States and around the world, as a way to make visible key transformations in the politics and epistemology of postwar biology and medicine. My favorite chapter in Life Atomic was "Pathways." It considered two case studies: The Hershey-Chase experiment (which I discussed before in this blog) and the use of radiocarbon to sort out the chemical reactions during photosynthesis. In this post, I focus on the photosynthetic research. Radioactive tracers played a key role in mid-20th-century biology. Their use is not as common in biological research today, but they are still important in medicine. To learn more, listen to Creager talk about the history of radioisotopes in science and medicine. Listen to Angela Creager talk about the history of radioisotopes in biology and medicine. Ten years ago, I wrote a blog post about Edward Tufte's book The Visual Display of Quantitative Information. Recently, we discussed this book in a graduate class I am teaching. One goal of the course is for students to learn how to write scientific papers, including drawing figures. 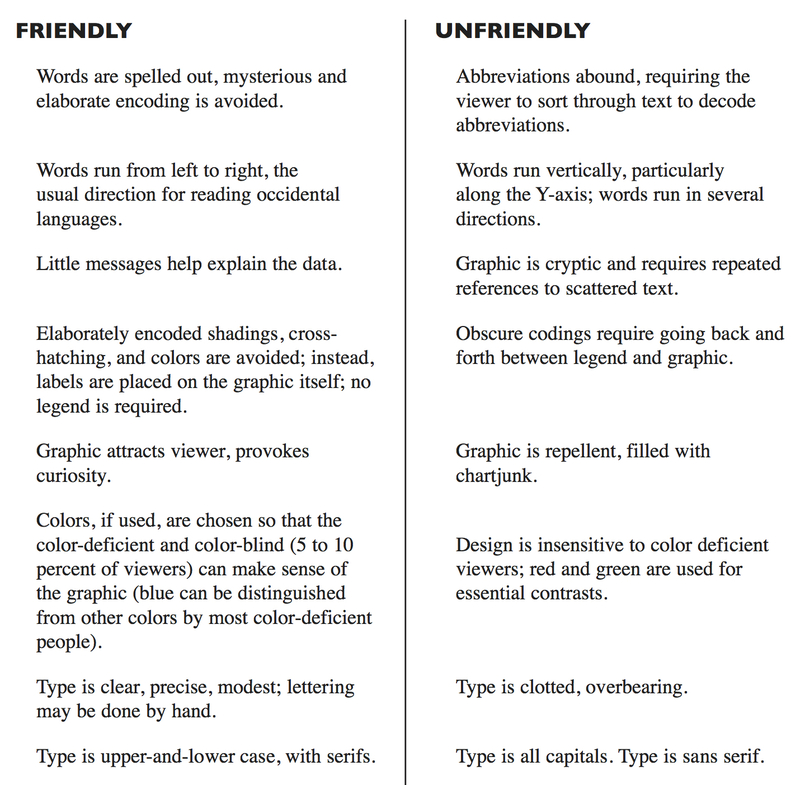 I like Tufte's advice (below) about friendly data graphics. 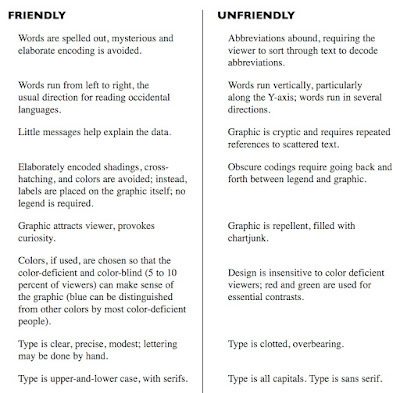 I agree with everything he says, except for his distaste of sans serif fonts. I wanted to give the students examples of how to improve illustrations but I didn't want to pick on a colleague, so I found a couple figures from my own papers that could be friendlier. The first one is from an article about magnetic stimulation that Peter Basser and I wrote. On the left is the original, and on the right is my revision. by electromagnetic induction. IEEE Trans Biomed Eng 37:588-597. The purpose of this figure was to show where magnetic stimulation occurs. That message was in the original figure, but you had to read the caption carefully to find it. In my revision, I clearly marked the locations where depolarization (that is, excitation) and hyperpolarization occur. The big square surrounding the original figure is what Tufte would call "chartjunk" and I deleted it. Instead, I tried to focus on the data. I also labeled the nerve and the coil, so you don't have to read the figure caption to determine what's what. Including units on one of the numerical values practically eliminated the need for a caption at all. I confess, the original figure was cropped from a mediocre scan of the article. 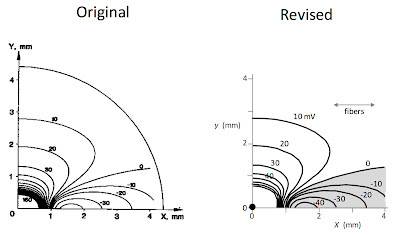 Therefore, let's not focus on which figure is crisper, but rather on the overall design. Also, the 30-year-old original data is long lost so I had to retrace the contours in powerpoint using the polygon tool. If you look at the revised figure using high magnification, you may be able to see this. Nevertheless, in my opinion, the revised figure is better. 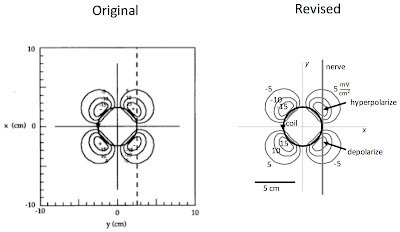 Another example is from a paper about the electrical stimulation of cardiac tissue. two-dimensional anisotropic bidomain. Biophys J 55:987-999. The message of this figure is that adjacent regions of depolarization and hyperpolarization form when tissue is stimulated by a cathode. By shading the hyperpolarized region, I emphasized this message. I indicated the fiber direction, which is crucial to the main conclusion (tissue hyperpolarizes along the fiber direction). I eliminated the outer circle and subdued the coordinate axes to highlight the data, and inserted a black dot at the location of the cathode. You can decide if it's an improvement. A different version using color and containing all four quadrants is shown below. Sepulveda, Roth and Wikswo (1989). Another confession: each original illustration was one frame from a multipanel figure. They might have been drawn differently were they stand-alone figures (but I doubt it). Tufte has published several books on visualizing information, but my favorite remains The Visual Display of Quantitative Information. You decide if Russ Hobbie and I follow his advice in Intermediate Physics for Medicine and Biology. Sign up for his course on presenting data and information at his website. Listen to Tufte talk about the future of data analysis in the video below. Edward Tufte talking at the Machine Learning and Data Science Summit 2016 Keynote Session. 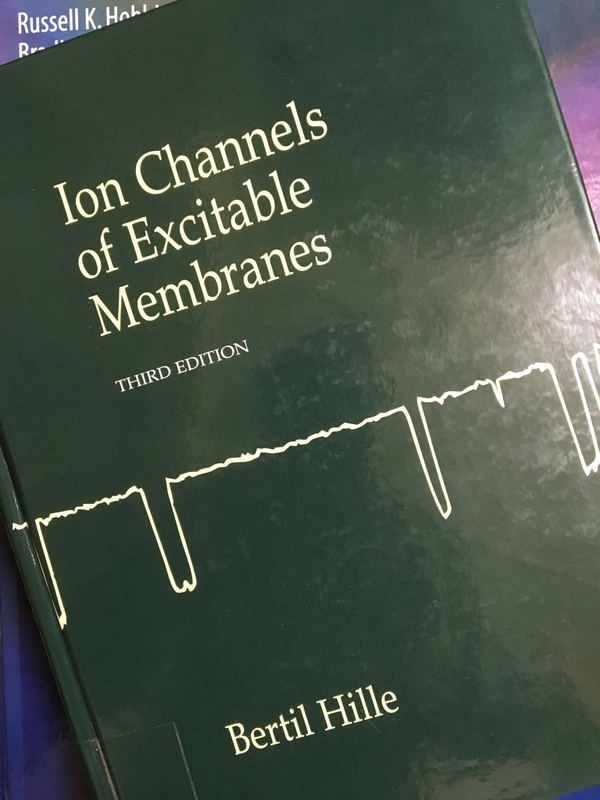 Not only is Bertil Hille’s book Ion Channels of Excitable Membranes a classic, but also it's extraordinarily well written. 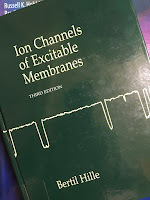 To learn about ion channels, read this book. Ion channels are macromolecular pores in cell membranes. When they evolved and what role they may have played in the earliest forms of life we still do not know, but today ion channels are most obvious as the fundamental excitable elements in the membranes of excitable cells. Ion channels bear the same relation to electrical signaling in nerve, muscle, and synapse as enzymes bear to metabolism. Although their diversity is less broad than that of enzymes, there are still many types of channels working in concert, opening and closing to shape the signals and responses of the nervous system. Sensitive but potent amplifiers, they detect the sounds of chamber music and guide the artist's paintbrush, yet also generate the violent discharges of the electric eel or the electric ray. They tell the Paramecium to swim backward after a gentle collision, and they propagate the leaf-closing response of the Mimosa plant. Hille appreciates the role of physics in electrophysiology. Let's look at some topics covered by both IPMB and ICEM. Russ and I briefly mention toxins, saying “an example is tetrodotoxin (TTX), which binds to sodium channels and blocks them, making it a deadly poison.” Hille goes into more detail, explaining how toxins help separate currents and identify channels. Pharmacological experiments with [channel blocking toxins] provided the first evidence needed to define channels as discrete entities. The magic bullet was tetrodotoxin (dubbed TTX by K.S. Cole), a paralytic poison of some puffer fish... In Japan this potent toxin attracted medical attention because puffer fish is prized there as a delicacy—with occasional fatal effects. Tetrodotoxin blocks action potential conduction in nerve and muscle. Toshio Narahashi brought a sample of TTX to John Moore’s laboratory in the United States. Their first voltage-clamp study with lobster giant axons revealed that TTX blocks INa [the sodium current] selectively, leaving IK and IL [the potassium and leak currents] untouched... Only nanomolar concentrations were needed. Russ and I continue “the next big advance was patch-clamp recording…[which] revealed that the [ion channel] pores open and close randomly.” Hille expands on this idea. Patch clamp ... forced a revision of the kinetic description of channel gating. At the single-channel level, the gating transitions are stochastic: they can be predicted only in terms of probabilities. Each trial with the same depolarizing step shows a new pattern of openings! Nevertheless, as Hodgkin and Huxley showed, gating does follow rules... Brief openings of Na channels are induced by repeated depolarizing steps... The openings appear after a short delay and cluster early in the sweep. When many records like this are averaged together, the ensemble average has a smoother transient time course of opening and closing, resembling the classical activation-inactivation sequence for macroscopic INa. 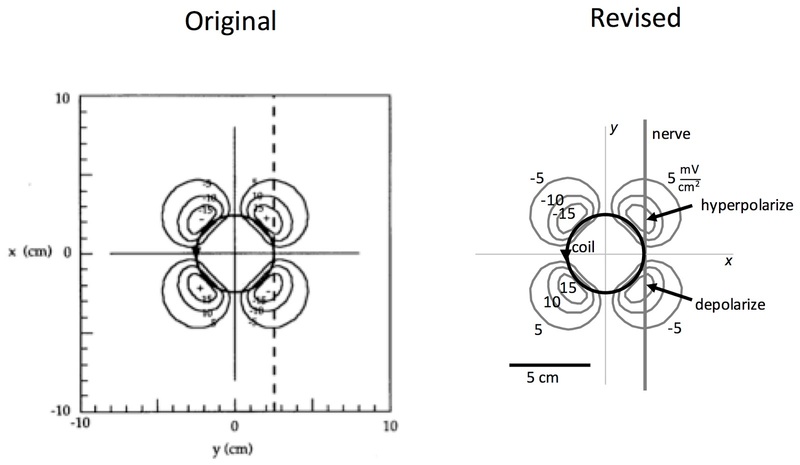 Hille's Figures 3.16 and 3.17—showing many individual patch clamp recordings averaged to reproduce the macroscopic Hodgkin and Huxley sodium and potassium currents—are my favorite illustrations in ICEM. Russ and I have one paragraph about calcium channels. Hille has a whole chapter. The biophysical properties of Ca channels might have been determined by classical voltage-clamp methods if the channels occurred in high density on a reliably clampable membrane. However, these channels are never found in high density, and many of the interesting ones occupy membranes that are difficult to clamp, such as dendrites, nerve terminals, and the complex infoldings of muscle cells. Even when Ca channels are on the surface membranes, as in the cell bodies of neurons, their small currents tend to be masked by those of many other channels, especially K [potassium] channels. The ambiguities caused by these problems delayed biophysical understanding of Ca channels. Russ and I relegate inward rectification to a homework problem. Hille discusses why inward rectifiers are important. Axons seem to be built for metabolic economy at rest. At the negative resting potential, all their channels tend to shut, minimizing the flow of antagonistic inward and outward currents and minimizing the metabolic costs of idling. Depolarization, on the other hand, tends to open channels and dissipate ion gradients, but the inactivation of Na channels and the delayed activation of K channels in axons keeps even this expenditure at a minimum. The second economy, in non-pacemaker cells of the heart, is a type of K channel, the inward rectifier, that stops conducting during depolarization. The total membrane conductance is actually lower during the plateau phase of such action potentials than during the period between action potentials... Again antagonistic current flows are minimized. Heart muscle has a variety of K channels, many of which have the property of inward rectification or of rapid inactivation. Other topics covered in both IPMB and ICEM are Roderick MacKinnon’s study of the structure of the potassium channel, and the Hodgkin and Huxley model for the action potential in a squid axon. Having coauthored a textbook, I appreciate how much work must have gone into writing ICEM. The figures are all clear, drawn in a uniform style, with a focus on the data. To have a consistent look, you can’t just cut and paste figures from an article into a book. They had to be lovingly reproduced and reformatted. The list of references contains about 1800 articles summarizing the literature up to 2001, the date of the most recent edition. The language is clear and readable. Young scientists looking for an example of effective scientific writing should read ICEM. Hille appreciates the history of his subject. Concepts are clearer when placed in historical context. The book is authoritative because the author is a giant in his field. He received the Lasker award (America's Nobel) for his work on ion channels. I would compare ICEM to the robust hybrid offspring of a marriage between Solid State Physics (Ashcroft and Mermin) and Nerve, Muscle, and Synapse (Katz). Intermediate Physics for Medicine and Biology is superior to Ion Channels of Excitable Membranes in one way: homework problems. ICEM has none and IPMB has hundreds. 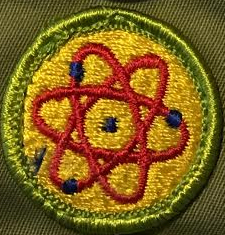 My Atomic Energy Merit Badge. Chapter 17 of Intermediate Physics for Medicine and Biology discusses nuclear physics and nuclear medicine. I began studying nuclear physics fifty years ago. It all started in the Boy Scouts. 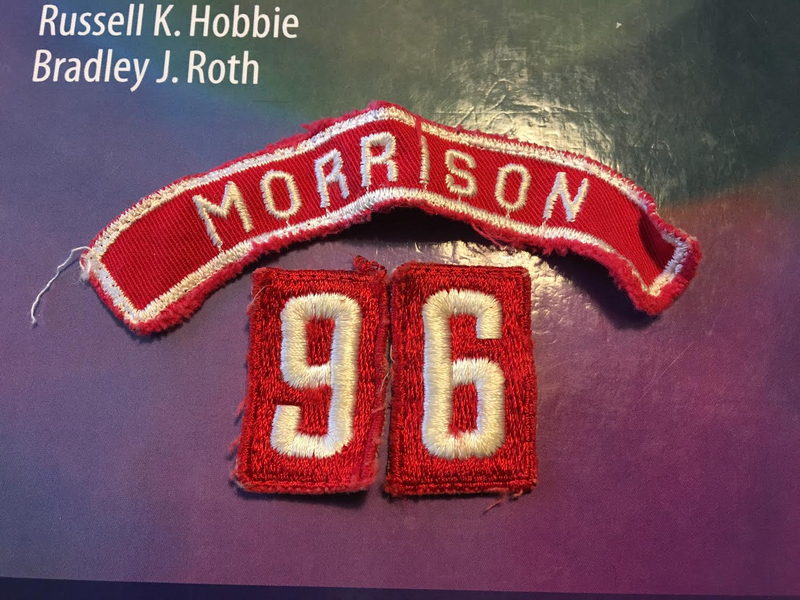 When growing up in Morrison, Illinois, I was a member of the Cub Scouts and then the Boy Scouts. I enjoyed the camping, hiking, and canoeing. Each summer I spent a week at scout camp, and loved it. In the winter, we would have a Klondike Derby, which involved pushing a large sled over the snow and then camping in the cold. 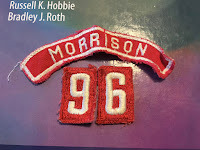 I was a member of Morrison’s Troop 96 and Mr. Glenn Van Eaton was our Scoutmaster; behind his back we called him “General Glenn.” One of my fondest memories was being inducted into the Order of the Arrow. At a campfire ceremony, several of us were “tapped-out” for initiation, which involved spending a night in the woods alone. Between campouts, we earned merit badges. Some of them you'd expect, such as first-aid, rowing, swimming, and pioneering (knot tying). 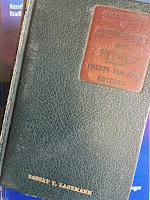 Others examined adult topics, such as atomic energy. 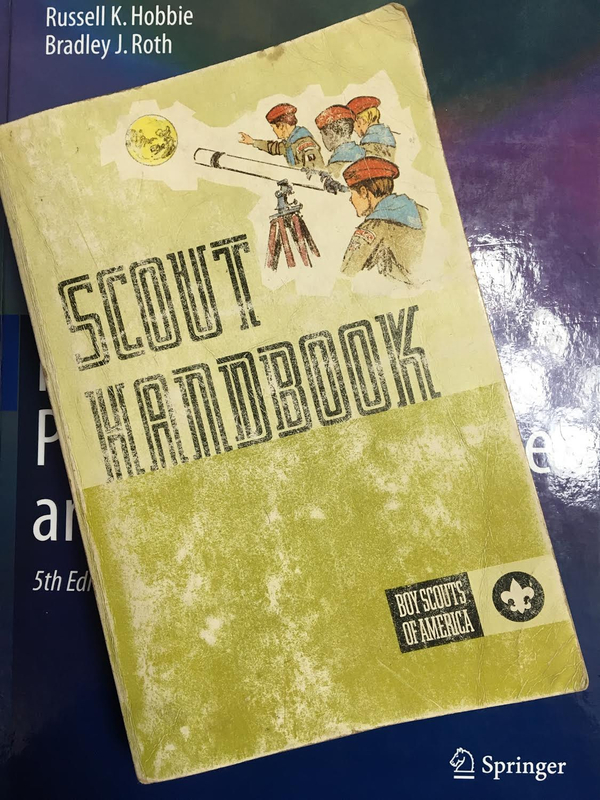 I found my old Scout Handbook—molding in a box in our basement—and looked up the requirements for the atomic energy merit badge. They are impressive. 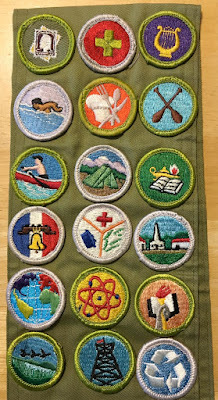 Completing this merit badge provides a good preparation for Chapter 17 of IPMB. Tell the meaning of the following: alpha particle, atom, background radiation, beta particle, curie, fallout, half-life, ionization, isotope, neutron activation, nuclear reactor, particle accelerator, radiation, radioactivity, roentgen, and X-ray. Tell who five of the following people were. Explain what each of the five discovered in the field of atomic energy: Henri Becquerel, Niels Bohr, Marie Curie, Albert Einstein, Enrico Fermi, Otto Hahn, Ernest Lawrence, Lise Meitner, William Rontgen, and Sir Ernest Rutherford. Explain how any one person’s discovery was related to one other person’s work. Draw and color the radiation hazard symbol. Explain where it should be used and not used. Tell why and how people must use radiation or radioactive materials carefully. Visit a place where X-rays are used. Draw a floor plan of the room in which it is used. Show where the unit is. Show where the unit, the person who runs it, and the patient would be when it is used. Describe the radiation dangers from X-rays. Visit a place where radioisotopes are being used. Explain by a drawing how and why they are used. Build a Geiger counter? Mom would have vetoed that! 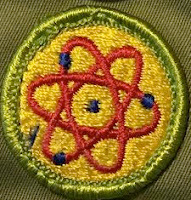 Working on the atomic energy merit badge may have been my initial exposure to physics; the first step in a long journey. 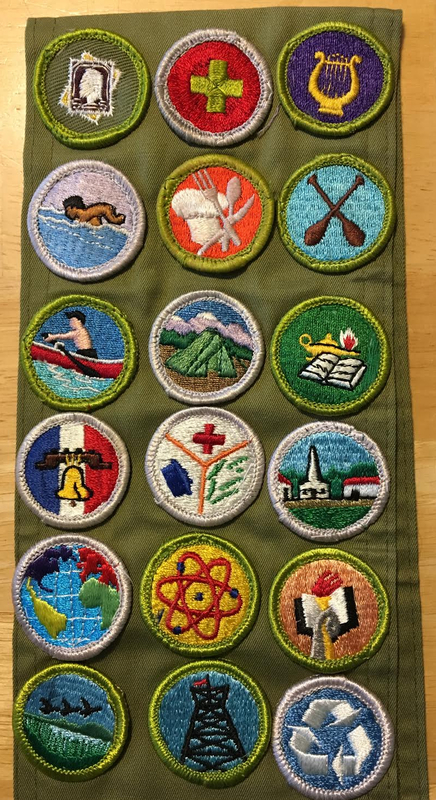 Now it is called the nuclear science merit badge. Some of the requirements are the same, but there is more emphasis on radiation hazards (for example, radon) and nuclear medicine. Probably it is even better at preparing you for Intermediate Physics for Medicine and Biology. My dad made it to Eagle Scout when he was young, but I didn’t uphold the family tradition. I quit scouts with the rank of Life. Most boys enter high school and lose interest in scouting, but a few hang on and make it to Eagle. I was planning on being one of the few, but when we moved out of town after my sophomore year I didn't restart with a new troop. Besides, I attended high school in the post-Vietnam/Watergate era, when scouting went out of fashion. Over the years, I came to disagree with the Boy Scouts’ positions on homosexuality and religion, so I don’t regret dropping out. But when I was a kid in Morrison, those issues never came up. We just had fun. My Order of the Arrow sash. Fish and Wildlife Management, Pioneering, and Environmental Science. Those with a silver rim are required for Eagle. In Chapter 14 of Intermediate Physics for Medicine and Biology, Russ Hobbie and I discuss ultraviolet light, and specifically sunscreen. Protection from the sun certainly reduces erythema [sunburn] and probably reduces skin cancer. Protection is most important in childhood years, both because children receive three times the annual sun exposure of adults and because the skin of children is more susceptible to cancer-causing changes. The simple sun protection factor (SPF) alone is not an adequate measure of effectiveness, because it is based on erythema, which is caused mainly by UVB [ultraviolet B light, with wavelengths from 280 to 315 nm]. Some sunscreens do not adequately protect against UVA radiation [315-400 nm]. Buka (2004) reviews both sunscreens and insect repellents for children. He finds several products that adequately block both UVA and UVB. Look for a sunscreen labeled “broad spectrum” or with at least three stars in a UVA rating system. An adequate amount must be used: for children he recommends 1 fluid ounce (30 ml) per application of a product with SPF of 15 or more. The desired application of sunscreen is 2 mg cm−2. Typical applications are about half this amount. It has been suggested that one make two applications (Teramura et al.2012) or use a sunscreen with a very high SPF (Hao et al.2012). This week the Food and Drug Administration has issued a proposed update to sunscreen rules. The feds then get specific. Of the 16 currently marketed active ingredients, two ingredients – zinc oxide and titanium dioxide – are GRASE for use in sunscreens; two ingredients – PABA and trolamine salicylate – are not GRASE for use in sunscreens due to safety issues. There are 12 ingredients for which there are insufficient safety data to make a positive GRASE determination at this time. Latha et al. (Sunscreening Agents: A Review, The Journal of Clinical and Aesthetic Dermatology, Volume 6, Pages 16-26, 2013) discuss the mechanism of sunscreen action (references removed). Sunscreening agents contain titanium dioxide (TiO2), kaolin, talc, zinc oxide (ZnO), calcium carbonate, and magnesium oxide. Newer chemical compounds, such as bemotrizinol, avobenzone, bisoctizole [sic], benzophenone-3 (BZ-3, oxybenzone), and octocrylene, are broad-spectrum agents and are effective against a broad range of solar spectrum both in experimental models and outdoor settings. Ecamsule (terephthalylidene dicamphor sulphonic acid), dometrizole trisiloxane [sic], bemotrizinol, and bisoctrizole are considered organic UVA sunscreening agents... Commercial preparations available in the market include a combination of these agents to cover a wide range of UV rays. Composition and mechanism of action of sunscreening agents vary from exerting their action through blocking, reflecting, and scattering sunlight. Chemical sunscreens absorb high-energy UV rays, and physical blockers reflect or scatter light. Multiple organic compounds are usually incorporated into chemical sunscreening agents to achieve protection against a range of the UV spectrum. Inorganic particulates may scatter the microparticles in the upper layers of skin, thereby increasing the optical pathway of photons, leading to absorption of more photons and enhancing the sun protection factor (SPF), resulting in high efficiency of the compound. Researchers are postulating that the generation of sunlight-induced free radicals causes changes in skin; use of sunscreens reduces these free radicals on the skin, suggesting the antioxidant property. Broad-spectrum agents have been found to prevent UVA radiation-induced gene expression in vitro in reconstructed skin and in human skin in vivo. Sunscreens may have unanticipated side effects. For instance, Key West banned sunscreens containing oxybenzone and octinoxate, two chemicals that damage coral reefs. Do sunscreens cause cancer? Read what Harriet Hall, the SkepDoc, thinks (quick summary: no). To learn more about sunscreens, here’s a video from one of my favorite explainers of physics: Dianna Cowern, The Physics Girl. She’s GRASE. Dianna Cowern, The Physics Girl, discussing sunscreens.